OSWEGO, NY – You can’t spell champion without FSB. Well, yes, you can. But not that often when you’re talking about the Trinity Catholic School Corporate Spelling Bee. Fulton Savings Bank recently out-spelled seven other teams to capture the crown. 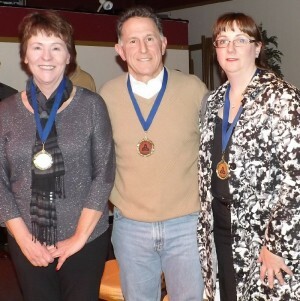 Dave Mirabito is flanked by team members Marilyn Boucher, left, and Karyn Santore. It was the team’s second win since 2008. Mimi’s earned the title in 2009 and Holy Trinity Parish captured the event in 2010. FSB won the “2011” bee (which was delayed until January 2012). The words for the 13th annual fund-raiser were the hardest in the history of the competition. More than one speller was left scratching their head and asking for the word to be pronounced more than once in the latter rounds. “I don’t know where these words came from, but I’d hate to be a middle school student trying to spell some of them!” exclaimed Lisa Kreinheder, captain of the runner-up Holy Trinity Parish team. The annual Trinity Catholic School Corporate Spelling Bee is one of the school largest and most popular fund-raisers. Tim Annal served as the master of ceremonies for the evening and Vernon Tryon was the bee’s pronouncer. At The American Foundry, eight teams spelled off to earn the right to claim the title and the championship plaque, engraved with the names of the winners. Besides Fulton Savings Bank and Holy Trinity Parish, the three-person teams included: Trinity Catholic Teachers, St. Mary’s Parish, the Oswego County Historical Society, St. Paul’s Alumni Team, Trinity Catholic Home and Schol, and NRG. The teams battled back and forth on stage at the American Foundry. The words were very tricky this year, yet the competition lasted for an hour and 10 minutes. The teams never came close to the two-minute deadline on spelling, much less hit one minute for that matter in the early going. The first rounds usually feature easy words such as falter, calendar and enact. It took seven minutes for the teams to spell their way through round one. Trinity Catholic Home and School had the dubious honor of being the first team out when they missed contrary. Then another seven minutes and round two was over. At one point, a team asked to hear their word in a sentence. The sentence contained a referrence to Justin Bieber’s “dreamy eyes,” which prompted Tryon to quip, “These are for a different audience” The word list is the same as the one used for the national scholastic spelling bee held in Washington, DC, each spring. In round three, NRG was the next team to exit when they incorrectly spelled unwontted. During round four Oswego County Historical Society had to grapple with apotheosis and Trinity Home and School managed to get past baccalaureate. However, in round five, turbulence was too rough for Oswego County Historial Society. The next round (#6) saw St. Mary’s Parish falter on legerity and moments later, celerity proved to be the undoing for the Trinity Teachers. St. Paul’s Alumni bowed out in round seven when they couldn’t find thier way in spelling geosynchronous. That set up the showdown between former champions Holy Trinity Parish and Fulton Savings Bank. With two teams left, it meant the winner had to spell two words correctly (the word the other team missed and its own word). If both teams missed the word, competition would continue. Round eight was a wash as FSB missed dicotyledon and HTP grivation. In round nine they missed synoptophore and wentletrap, respecuively. Then in round 10, it was formaldehyde and espagnole that prolonged the bee. As the clock tocked past 9 p.m., FSB correctly spelled schlockmeister and HTP missed bathymetry. That put FSB within a word of its seventh championship. Fulton Savings’ team included Mirabito, Marilyn Boucher and Karyn Santore. The three winners credit their spelling skills to their love of reading. “I really haven’t heard of some of htse words,” Boucher admitted. Previous winners are: Reynolds’ Law Firm (2000), Fulton Savings (2001, 2003, 2005, 2006, 2008), Pathfinder Bank (2002), Nestegg Credit (2004), Catholic Community of Fulton (2007), Mimi’s (2009 and 2011*), Holy Trinity Parish (2010). *A scheduling conflict for some of the competitors forced the 2011 edition to be conducted in January 2012. The event coordinators were Barb Sugar and Jane LeBlanc with Christina Chamberlain, Rebecca Rastley, Cathie Weeks and Jackie O’Brien making up the auction team. Sandi Moran was the official greeter. The event is designed to inspire educational values, team spirit and camaraderie and to raise funds for the support of the Catholic school, according to Principal Sugar. The judges for the competition were Anthony and Helen DiMartino with Steve Yablonski of Oswego County Today.com serving as the official timekeeper. Following the bee, there was a silent auction featuring a huge variety of donated goods. Among the items up for bid were donations from Laker Hockey Camp, Rudy’s, Bosco & Geers, Mom & Pop Soda Shop, Torbitt’s, Canale’s, Trinity Catholic School families and many others. Trinity is the sole Catholic school in the county; it is supported by all parishes in the county.